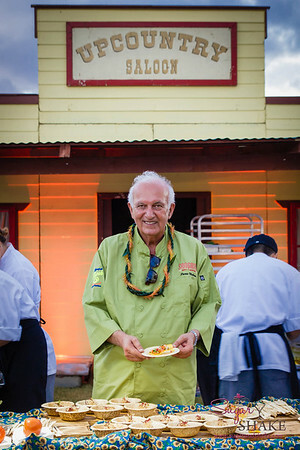 Now in its third year, the Kā‘anapali Fresh festival is an event I look forward to. 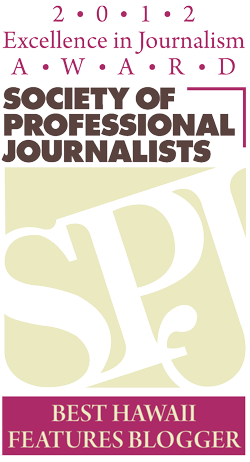 I feel quite fortunate to have attended each of these years at the invitation of the organizers. As I mentioned in my preview of this year’s events, the festival keeps getting better and better—they never seem to be satisfied with coasting along and keep seeking to make improvements. 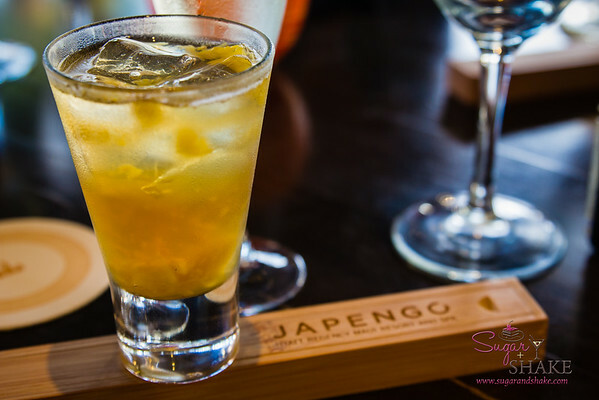 The media welcome was hosted at Japengo at the Hyatt Maui. 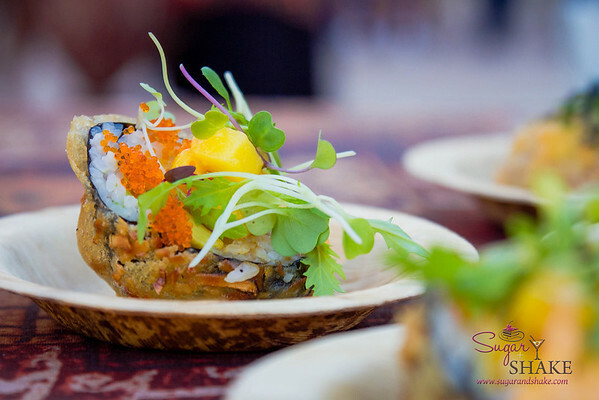 We were treated to tasty cocktails and a sushi-making demonstration by their sushi master, Chef Il Yuk “Kaz” Kim. We got to eat sushi, of course, which included a tray of seared aku which Shake and I snapped up. The mainland folks did not seem to be grooving to it. It’s such a small-kid-time flavor for me that I hardly get. 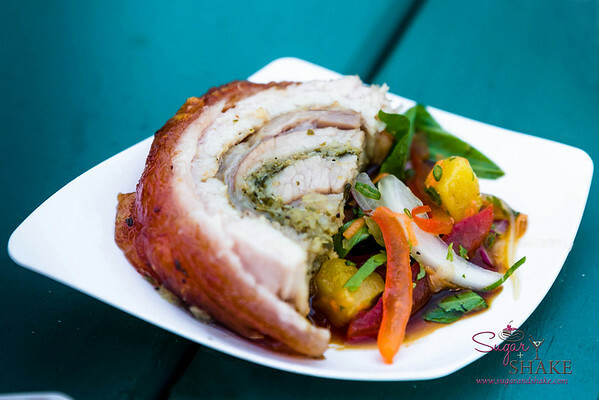 And we met Japengo chef Gevin Utrillo (that’s him photobombing the pig at toward the end of this post), so I got to tell him how much I enjoyed his dish at AgFest this year. He served up a delicious dinner which I was too busy eating to take any decent photos of. You’ll just have to believe me when I say it was beautifully presented and very tasty. 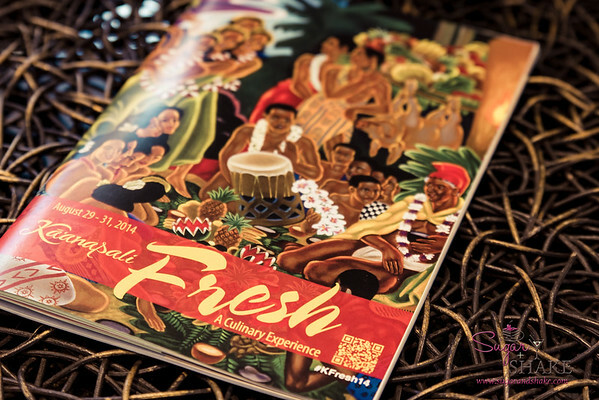 The first official event of the KFRESH weekend was the ‘Aha‘āina O Kā‘anapali. 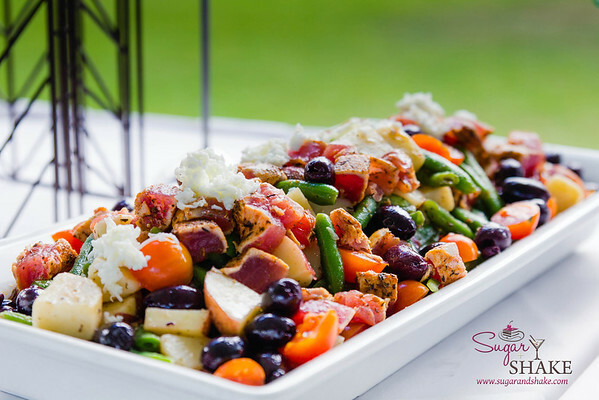 In previous years, this kick-off evening was done as a progressive dinner, so you had to motivate yourself to mosey on over to a new location, and didn’t have much of a formal opening. 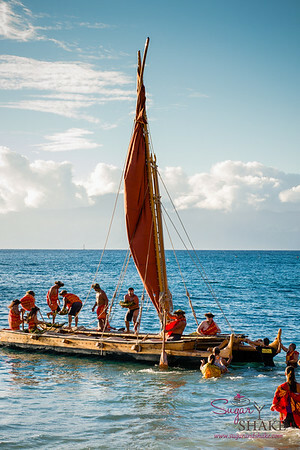 This year, it was contained to a single venue, the Westin Maui, and started with a ceremony on the beach in which a flotilla of outrigger canoes, along with a beautiful traditional double-hulled canoe, brought sailors bearing gifts of food. 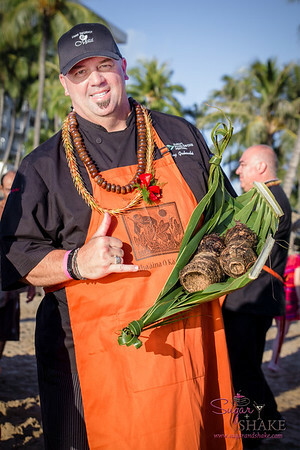 This was a ceremonial exchange in which the participating chefs for the evening were each presented with a palm frond basket containing ingredients from the ocean or land. It was a bit chaotic, though, since the beach had not been cleared, so there were a lot of confused tourists milling about with their beach towels right in the path of the canoes being beached. A word of warning: If you see a canoe coming up out of the water, get out of the way. The folks in it will move VERY quickly to push it up out of the water and the boats are extremely heavy. Don’t try to stand in its path to take a nifty picture of an oncoming hull. You will be crushed and they won’t be able to help it. The exchange was very cool and had some “chicken skin” moments as the chefs received their gifts of food. Each exchanged hā (breath) with the person bearing the gift. 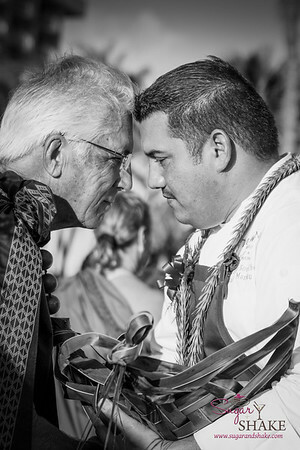 In Hawaiian ceremonies, this is generally done by leaning in to each other and touching noses or foreheads. It’s rather intimate and meaningful. It took us a while to make our way from the beach (stopping to wash off our very sandy feet) up to the event site, so we apparently missed the official welcome there. It also seemed that the “regular guests” didn’t know about the beach ceremony—as the event wound down, I heard one guest ask if he had missed “the canoe ceremony thing.” I think it’s a logistical challenge to incorporate both the ceremony and get people checked in to the event site and get started—but I’m sure the organizers will figure it out for next year! 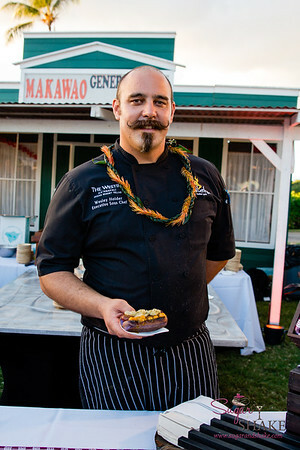 The food served was meant to represent a timeline of Hawai‘i cuisine. 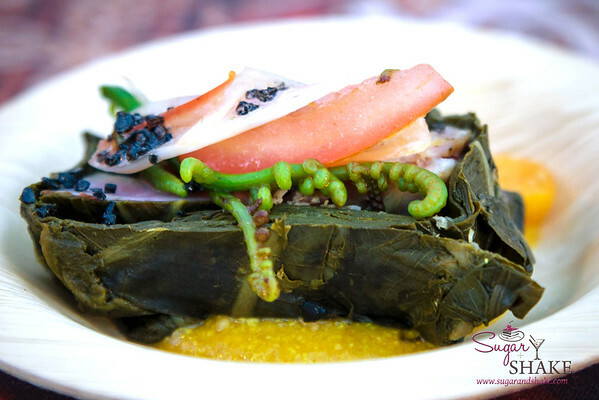 Simple ingredients—‘opihi, poi, sweet potato, poke—with hardly any preparation embodied “Old Hawai‘i.” I feel a little guilty for all the hard work the chefs put in saying that I enjoyed these selections the best! But it’s hard to beat fresh, fat ‘opihi and ogo-covered poke. 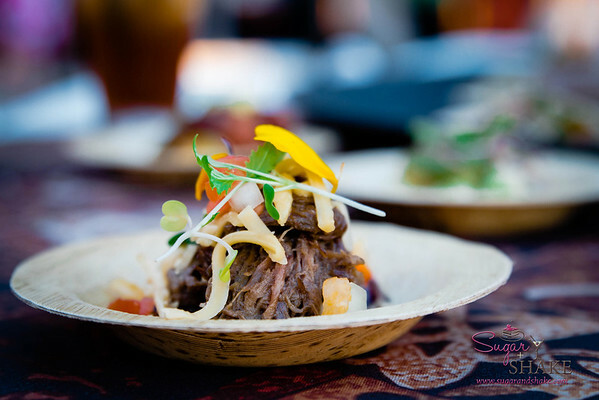 The orange-aproned chefs prepared food to represent Modern Hawai‘i, in the Hawai‘i Regional Cuisine style that’s still being evolved today, using local ingredients to create inventive dishes. Bellies full, we trundled off to bed so we could get up early the next morning to hit the Maui Grown Farmers Market. The market is a quarterly event at Whalers Village and this time I came prepared—I brought two tote bags and a cooler bag. I love this market. Kula strawberries for $3 a box—what a steal! Kaffir limes! ‘Ulu (breadfruit) chips! I also stocked up on my favorite Maui Preserved Vanilla Powder. I put that stuff in EVERYTHING. It’s awesome. There are always interesting products to see. 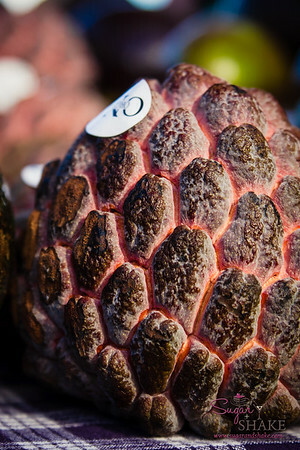 I found our friend @Melissa808 over at the Ono Farm booth examining this strange dragon egg-looking fruit. I’m pretty sure Khaleesi hatched one of these. I can’t remember what the farmer said it was, but he let us sample one. It was similar to mangosteen, with a creamy textured meat surrounding a large seed pit, several of those little lobes contained in each fruit. Melissa bought one. To this day, I have no idea what she did with it. 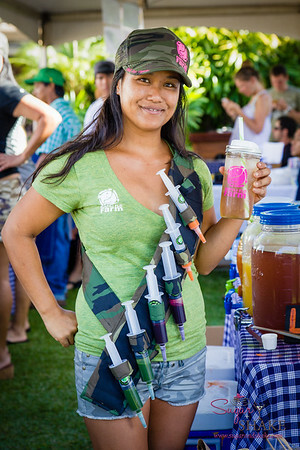 Over on the other side of the market, Napili FLO Farm was offering fresh juices and iced tea, which we desperately needed. (Seriously, could it be any hotter? It’s supposed to be fall, and it feels like Arizona. Ugh.) I got a ginger tea in their awesome hipster mason jar-with-straw-lid. 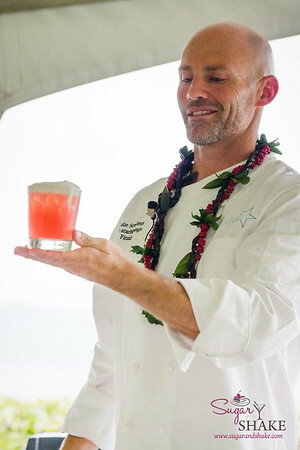 Shake, however, opted for one of the “shots” that Napili FLO’s Monica Bogar was offering. I mean, really, how awesome is this woman? Does she know how to grab your attention or what? She had carrot, beet and wheat grass shots available. And instead of having them in a cup, they came in those plastic syringes. Totally fun. 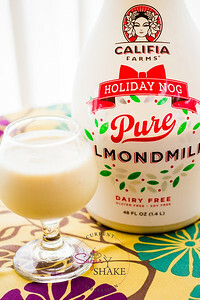 She said the kids liked them and it got them to drink their veggie juice. I am too clever to be tricked by her gimmicks, though! No beets for me!! Since Shake couldn’t choose between beet and carrot, Monica made a blend for him. He shot it. I’ll preserve his dignity and won’t post the photo here. After stashing our haul in our room (thank heaven for the Westin Kā‘anapali Ocean Resort Villas’ full size refrigerators! 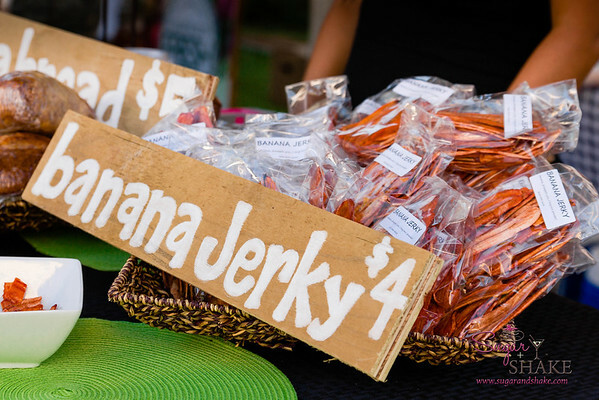 ), we made a quick jaunt into Lahaina town to get a couple slabs of the coveted Ilocandia lechón. (One for us, one for Melissa.) 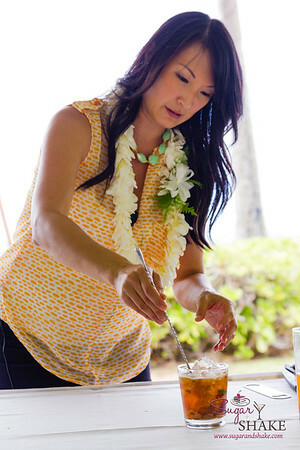 Then it was off to Fresh Mixology 101 at the Sheraton Maui. 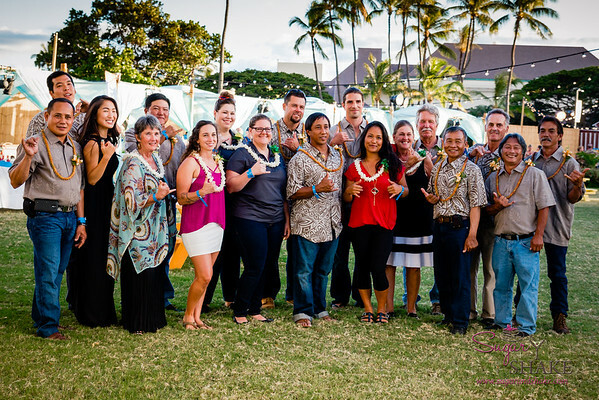 We did not attend this event last year because it was held before the first evening event and was taking place just as I was landing on Maui. 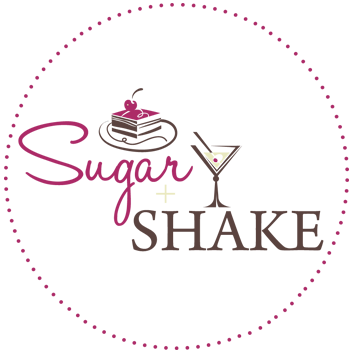 It’s nice that it’s now firmly part of the weekend and it seems to have grown in popularity since the first year. 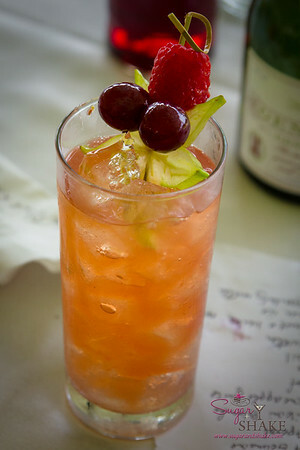 The opening cocktail was created by Chandra Lucariello of Southern Wine & Spirits as the signature drink for the event. 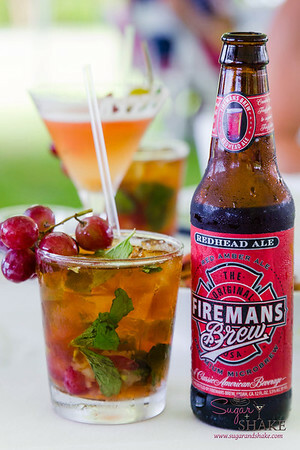 It was called the Pā‘ina and it was a spicy little sucker! There’s a whole half-ounce of chili pepper water in it. 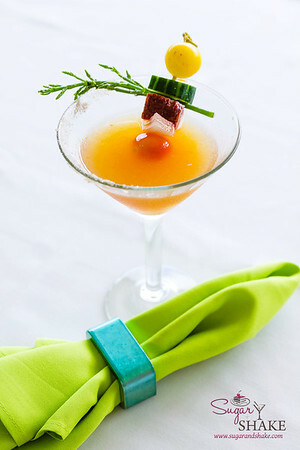 But I couldn’t stop drinking it—it was pretty delicious and came with a whole side-salad worth of garnish. 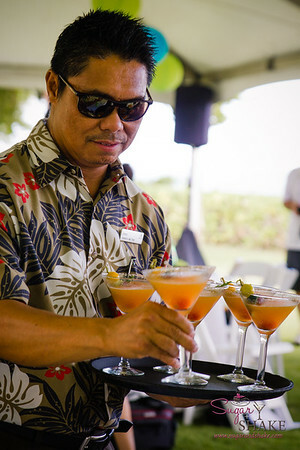 The seminar was led by Chandra and the Westin Maui’s Freddie Sconfienza, with both demonstrating several drinks each. The theme was “beer cocktails” which I have to say did not get me very excited. Not a beer fan. 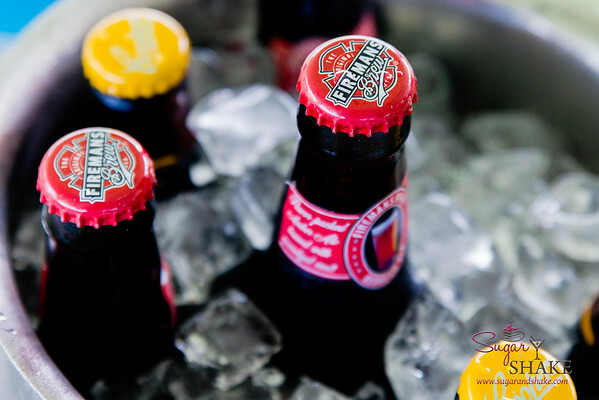 I wouldn’t choose to order any of the drinks, but they were pretty tasty…for having beer in them. We got pretty excited because the judges kept coming back to sample our entry…but in the end the win went to another table. I accosted Chandra later to learn that we were “soooo close” and the definite second place contender. 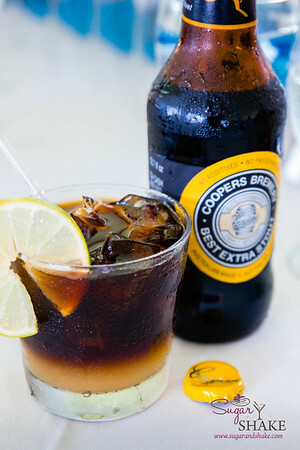 Well, not bad for a beer cocktail from people who don’t like beer! 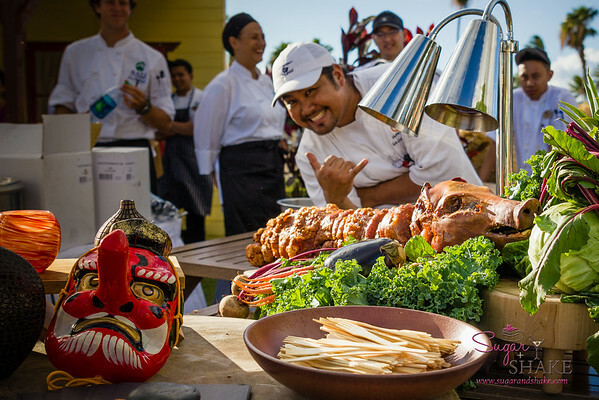 More food and fun at the weekend’s signature event, Kā‘anapali From Range to Sea! 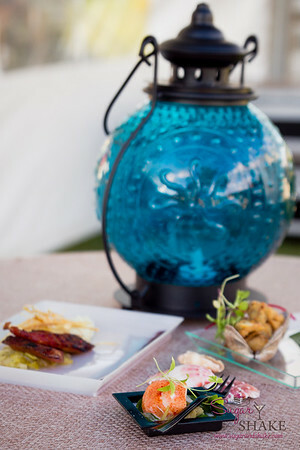 The event site was gorgeously and elaborately decorated, one side with touches evoking land (vegetables in watering cans, false building fronts to resemble old timey stores) and the other with ocean décor (coral, sea shells, lanterns resembling glass fishing floats). This event really takes the cake as far as design. They really go the extra mile to make it a beautiful event. 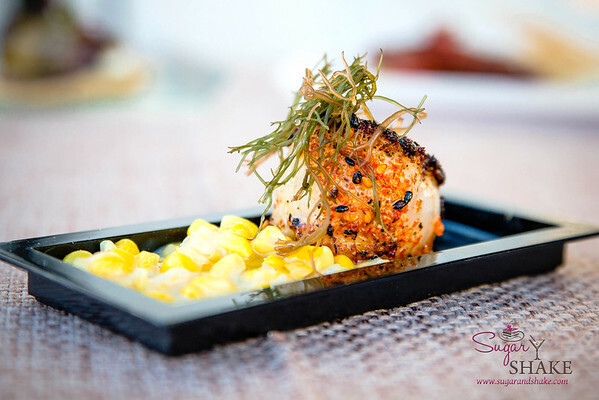 This year they even sprang for extra-special serving dishes so the chefs could really pretty up their dishes. 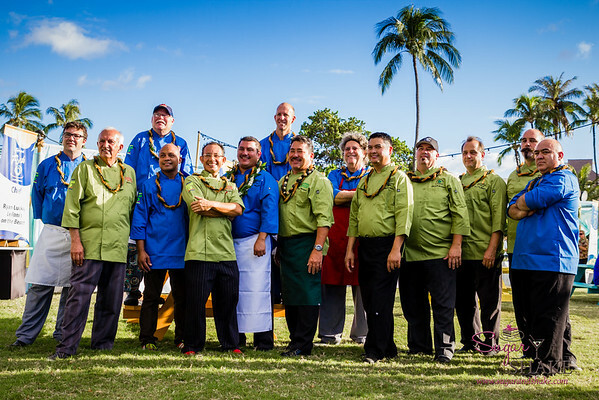 The chefs were divided up into “Land” (green jackets) and “Sea” (blue jackets), making dishes accordingly. 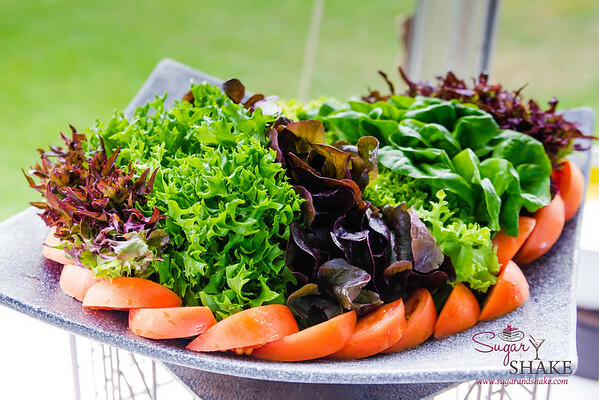 And while the chefs are highly celebrated throughout the weekend, the real heroes of the event—and every day—are the farmers. 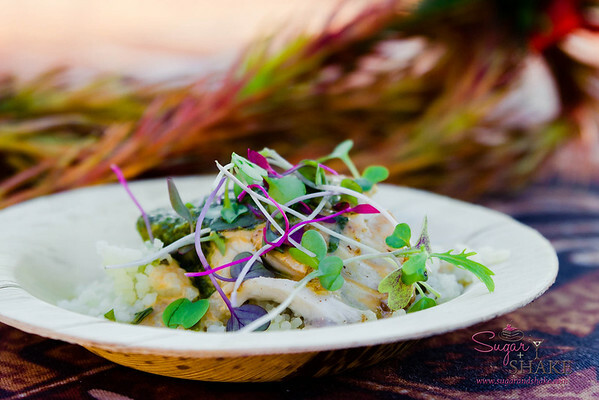 I was asked to photograph the chefs’ dishes as they were being submitted for judging for the Maui No Ka ‘Oi competition—that seemed like an overwhelming array of food with 11 chefs in the game. 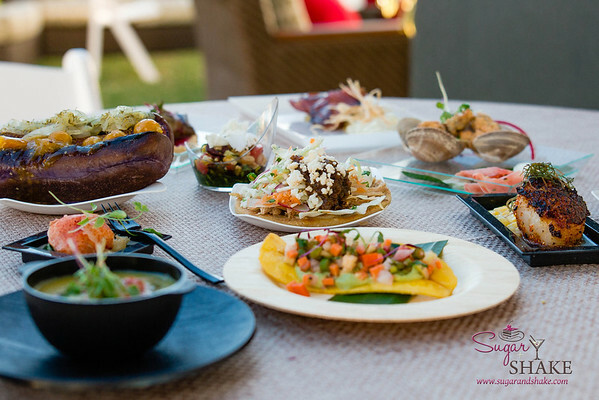 But after the judging was finished, I discovered each chef had made TWO dishes! I don’t know if anyone tried everything; we certainly couldn’t do it. 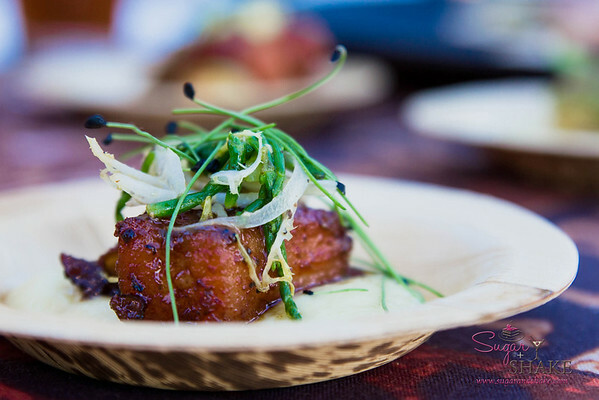 In addition to photographing, I was also the designated “pork stand in” for one of the judges who didn’t eat pork. 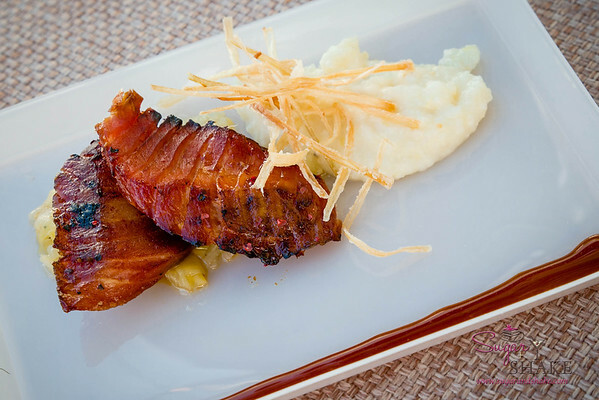 We were confused by this dish because apparently the server had insisted to the judge that it was “bacon,” having misunderstood the description. 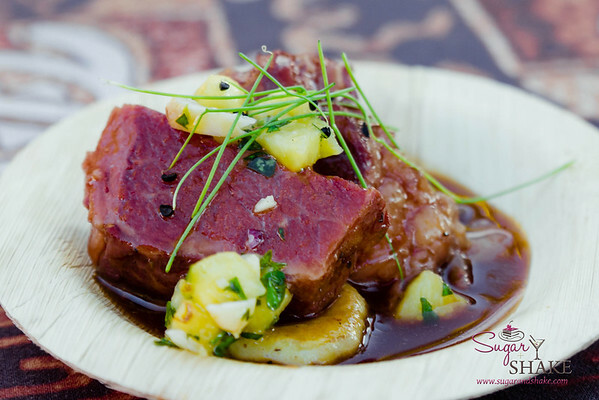 It was ‘ahi “bacon”—cured ‘ahi. And it was delicious! 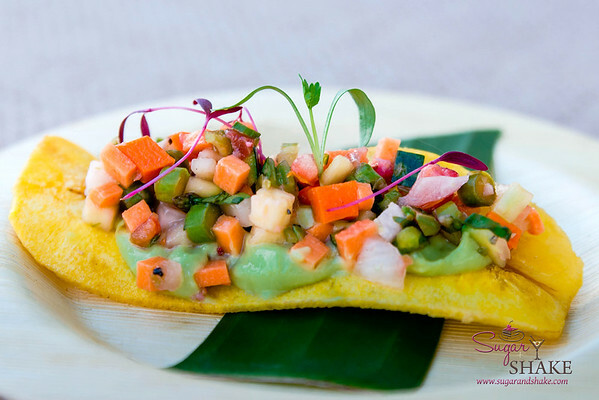 This dish was the judges’ pick for the Gold Award, a corn tamale by Chef Raymond Nicasio of the Sheraton Maui. 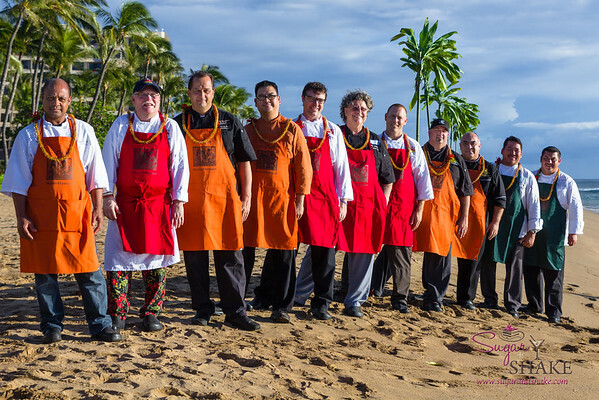 Here’s our pal Chef Wes Holder (left) of the Westin Kā‘anapali Ocean Resort Villas. (He took us on an awesome farm field trip last year.) 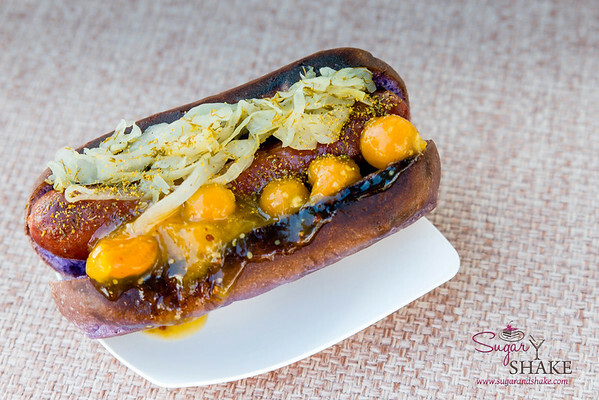 He made what he called a “venison weenie”—Moloka‘i venison frankfurter in a taro bun with an incredible poha berry mustard. I think that at our table, at least three of these were consumed. Possibly four. Chef Paris Nabvi of Sangrita Grill & Cantina had a cute station decked out with one of those false building facades. More dishes (hover over the photos for descriptions), though I haven’t included all the dishes that were served. There were just too many! 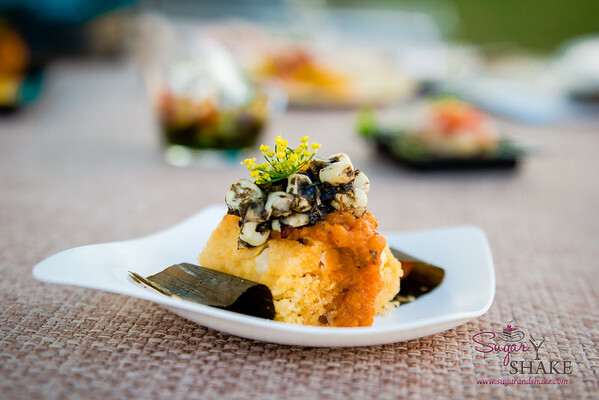 In an interesting twist, nearly all the chefs did a vegetarian dish along with their meat or seafood dish. 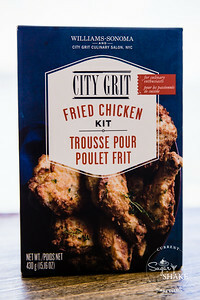 I didn’t even notice until someone pointed it out to me—that says a lot about how flavorful and filling they were. It was a nice way to showcase the local farmers’ work. 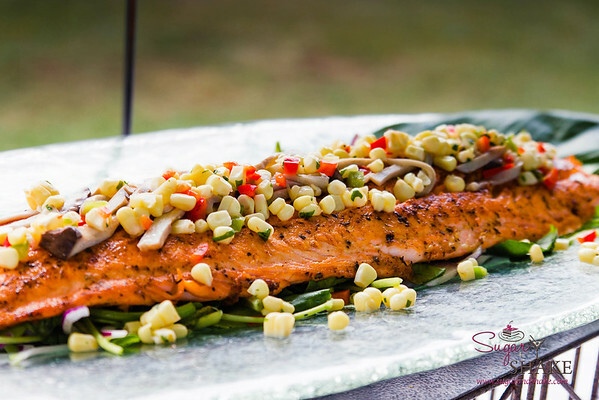 I also noticed that this year there seemed to be fewer dishes using items like ‘ahi or other deep-water fish that are in danger of being overfished. I’m not sure if that was an intentional move toward presenting a menu that’s more sustainable, or just a coincidence. 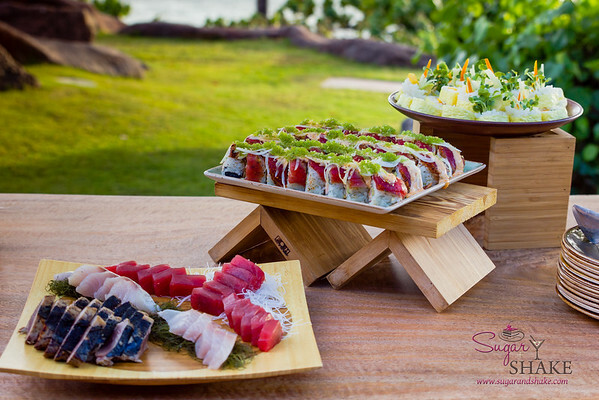 I sort of missed the sashimi-style dishes that seemed to abound last year, but I think it’s important for us to consider the impact of what we choose to eat, too. Well, that’s it for another KFRESH weekend! 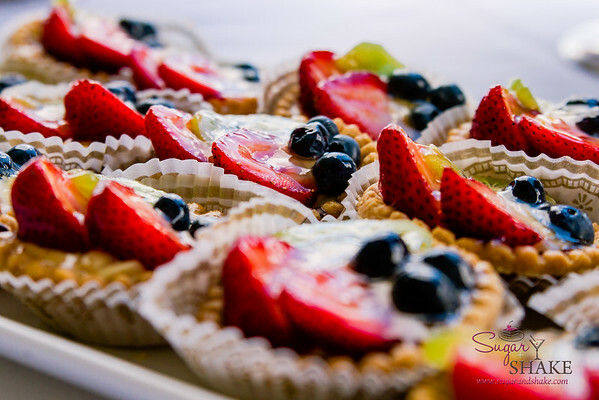 I highly recommend this as a food event to attend. 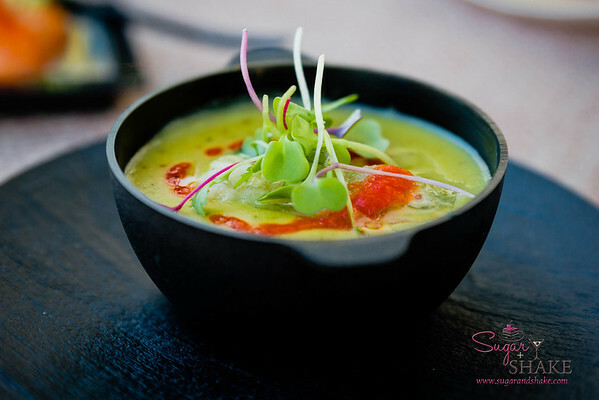 I love the laid-back vibe and the freshness of the food really lends itself to creating some great dishes. 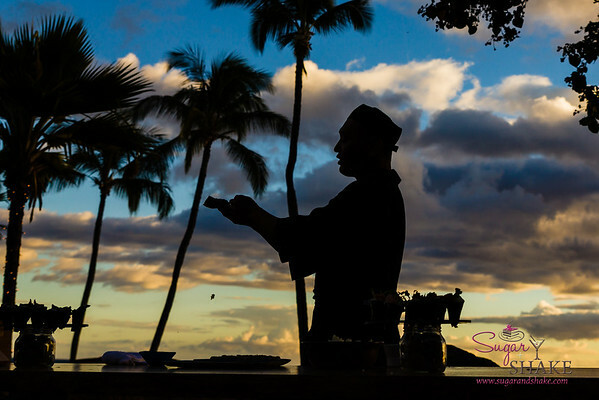 Disclosure: Sugar + Shake were hosted by the Maui Visitors Bureau, Kā‘anapali Beach Resort Association (Kā‘anapali Fresh) and the Westin Kā‘anapali Ocean Resort Villas. Travel, accommodations and access to events were provided by the hosts, but no compensation was received for this post, and the opinions expressed are strictly my own.